Is there life on other planets? If there is, do they have a "soul" and will they go to our Heaven and Hell? If there isn't life out there, why did God create such a humungous universe? Are we alone in the universe or is there other life out there? Is our planet the only one with life or is the universe riddled with planets populated with life? If you are like most people, you have asked yourself these questions one time or another. Public opinion has swung to extremes on this issue. In 1600, the Italian philosopher, Giordano Bruno was burned at the stakes because he maintained the "heretical" notion that there were countless other worlds out there containing life. In the 18th century, the pendulum shifted to the other extreme; many astronomers were convinced that every star had planets with life. Will Herschel (the man who discovered Uranus), even speculated that the sun was populated with life. In order for life to exist on other planets, there obviously has to be "other planets." Currently, we haven’t seen any other planets outside our solar system. I am sure they are out there (probably most stars have some type of orbiting bodies), but our current visual telescopes are far too limited to see these distant objects. The only reason we can even see stars is because they are gigantic floodlights blasting a tremendous amount of light in our direction. Planets, on the other hand, are very small and don’t produce their own light; they only reflect the light of their sun. The moons of Uranus provide us a great example of the difficulties of seeing "non-burning" objects in outer space. We originally thought that Uranus had only five moons. However, when Voyager flew by Uranus in 1986, it discovered ten more moons. If our telescopes couldn’t even see these nearby moons, there is no way that we would be able to see planets that are over 14.5 million times the distance. (Uranus is 1.7 million miles away and the nearest star is 24.7 trillion miles away). Another example of our limitations is the dwarf planet just recently discovered in our own solar system. On October 21, 2003 scientist discovered Eris (2003 UB313) a little past Pluto in the Kuiper Belt. Eris, which is a little larger than Pluto is not considered large enough to officially be called a planet, so it is called a dwarf planet. The fact we were totally unaware of Eris until a couple years ago shows the limitations of our telescopes. To compensate for this shortcoming, scientists are trying to find planets by measuring the movement of stars. They theorize that planets will exert a gravitational pull on their sun and slightly alter its movements. Although this technology is in its infancy and its findings are considered inconclusive by many scientists, 200 planets (as of 2006) have been "discovered." For the current list of planets discovered go to http://exoplanets.org/. NASA is also using the Spitzer infrared telescope to find planets by trying to detect heat from object orbiting distant stars. In my chapter, Our God is an Awesome God, I talked about the immense size of our universe. Our sun is part of a galaxy (the Milky Way) that consists of over 200 to 400 billion suns (stars). Although our galaxy is huge, it is just a minuscule dot in comparison to the rest of the universe. Our universe has over 100 billion galaxies. Why did God create these other galaxies? Was it to provide us light to "govern the night" (Genesis 1:6 and Psalm 136:9)? No, the stars in these galaxies are too far away to provide visible light to our naked (unaided) eye1. It is only the stars in our own galaxy that provide us our nighttime view and even then we are only able to see a small portion of them (about three thousand stars). In fact, we didn’t even know about the other galaxies until powerful telescopes were developed this past century. The galaxy above is similar to our Milky Way. The red circle shows the basic range of most of our nighttime vision. 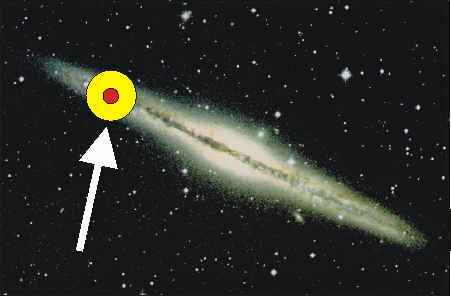 The yellow circle shows the location of some of the very bright stars we see at night. As you can see, we can see only a small portion of our own galaxy. There are hundreds of billions of other galaxies outside our normal field of vision. If these other galaxies are not for our benefit, why did God create them? Why did God create such a large universe? Is there some special purpose for such a large universe or did the blueprint for a quality "Grade A" universe come in only one size? Before we discovered that the universe was so huge, it was easy for us to think that we were probably alone in the universe. It was easy to think that the few thousand small dots in the sky were only there to provide us light at night. However, when we now see that over 99.999999…% of the universe was not created for "our benefit," we have to wonder why God made it so large. With a universe this size, it becomes easier to believe that maybe God has other special creations out there. Maybe God has hundreds or even trillions of planets inhabited with life. If there are other life forms out there, what are they like? What are their levels of intelligence and complexity? Do they have a "soul?" Does God take a personal interest in them like He does with us? If they have sinned, has God provided a special redemption for them like He has for us? Will their "redeemed" spend eternity in the same Heaven with us? Will their "lost" go to our Hell? Will their redeemed have the special privilege of being the "Bride of Christ" along with us? Obviously, the answers to these questions are beyond our reach. Technology is too limited to verify the existence (or non-existence) of life and the Bible doesn’t even address this subject. Therefore, as I present my view on this subject, keep in mind it is only my opinion and is not Biblical dogma. 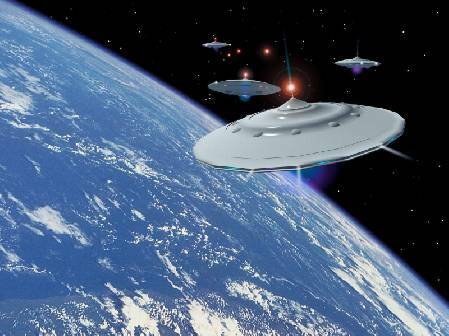 Do I believe there is extraterrestrial life on other planets? No. You may be surprised with this answer considering what I have already said. I believe that our tiny insignificant planet is the only planet in this humongous universe that has life. As incredulous and arrogant as this may sound, I believe that God built this humongous universe just for the human creation package. If the universe has a maximum life of less than 8,000 years, then all of the worlds that it contains will also have a maximum life of less than 8,000 years. As the footnote below shows, God will bring our society to its final culmination just before He ends the universe. Likewise, if there are other worlds out there, God will have to bring their societies to a final culmination before He ends the universe. If you are only talking about a couple planets with life, I can see (statistically) how this might be probable. Remember, a main argument some Christians have used to support the existence of extraterrestrial life is the "apparent" lack of need for these other galaxies. It is reasoned that if these galaxies have zero impact on us (or on each other) they must have been created to support other creation projects. Therefore, if supporting extraterrestrial life were the only reason for their existence, we would then have to assume that all of these galaxies have planets with life. If all of these galaxies don’t have life, we are back to our original question of, "Why did God create all of these unneeded galaxies?" Assuming that there is only one planet with life per galaxy, there would be over 100 billion planets with life. If, however, every star in each galaxy has a planet with life, you will have to multiply the above number by at least another 100 billion. It seems very improbable (statistically) that all of these other societies will have their final culmination at the exact same time as us. Our God could do that, of course, but it seems highly unlikely. If the purpose of this large universe was not to accommodate other life forms, why then did God create it so large? I see four main reasons why God made this universe as large as He did. First, it seems that almost everything God does is a first-class major production. I think God likes creating spectacular and awesome things and He enjoys looking at the finished product. Second, I think God wanted to give our world a surrounding that has no visible end, a surrounding that seems complete. God could have created our world the same way Hollywood creates a city street for a movie: Fake fronts on all of the buildings. When you walk down a Hollywood street, you see a city that looks complete. However, when you take a closer look and peek behind the doors and windows, you find that the buildings are not real. I think God wanted to create a surrounding for us that could withstand as much scrutiny as we could give. As technology increased, we discovered that atoms were made up of neutrons, protons, and electrons. Later, we discovered that these small particles were made up of smaller particles called quarks. I personally don’t think we will ever find the smallest building block particles. Likewise, I don’t think we will ever find the final limits of outer space. I believe God knew that we would eventually break out of the shell of our immediate surroundings and He wanted something out there that we could see and explore. What would have happened if God made our surrounding boundaries much smaller? I’ll try to give you an example. Let’s say that God created a brand new world and populated it with a colony of 1,000 people. These people were placed in the middle of a territory that looked like one of our deserts. As far as they could see in all directions, there was nothing but sand, cactus, rocky hills, etc. Since the only water supply was in the middle of this desert, this primitive community could not travel more than 20 miles in any direction. A thousand years later the community is still centered around the water supply. The faces have changed and their population has fluctuated, but the community is still tied to their water supply. Then, one day someone discovered that glass can be made by super-heating the desert sand. Before long, large water jugs were made and people began to travel and explore. As people reached distances of 100 miles, they discovered something unusual. They find that the "endless" desert suddenly stops. About 100 miles in all directions from the watering hole they find a gigantic wall surrounding the desert. Since this wall was blue in color, it blended in well with the background. Even the rocky hills suddenly stopped with no back sides to them. Since this wall seemed infinitely tall and indestructible, exploration stopped at this point. This discovery, of course, would not alter their belief in God. It would not change their life significantly. Life would carry on as usual up to that 100 mile boundary. I do believe, however, that this discovery would be rather confusing and disconcerting. I think they would wonder why God chose to put the boundaries where He did. They would wonder why God put the "end of the world" so easily within their grasp. Somehow their world would probably seem incomplete. The third reason that I think God created our universe so large was for the sake of those in eternity (both the angels and believers in Heaven). God is obviously mightier, more complex, and more magnificent than the universe He created. This immense universe provides others a tangible glimpse of His greatness and power. It displays His wisdom, majesty, and creativity. Psalm 19:1 says, "The heavens declare the glory of God." The fourth reason I think God created our universe so large was to give those of us on Earth a glimpse of His power and majesty. I think He wanted to demonstrate that He truly is Lord of lords and King of kings. If the universe consisted of only our planet, we would think God was great, but His true greatness would still be hidden from us. Now, that we have a glimpse of the magnitude of the universe, we have a better appreciation of God’s true greatness. We learn more about God as we learn more about His creation. Yet, with all we have seen, I still don’t think we even come close to understanding God’s true magnitude. As I said before, we were unaware of the immense size of the universe until this last century. Therefore, some people say that this gigantic universe was not created to show us (those here on Earth) His glory. I have two responses to this. First, God’s revelation of Himself is progressive. Mankind has learned more about God as the centuries have unfolded. Moses knew more about God than Abraham. King David knew more than Moses and the Apostle Paul knew more than King David. Therefore, I don’t find it surprising that we know more about God than our predecessors. My second response is I think God continually reveals more about Himself to keep us humble. As we (mankind) make educational and scientific advances, we begin to get delusions of grandeur. Our "great" technological advances tend to make us proud, arrogant, and overconfident. As we begin to harness incredible powers through technology, we begin to think we can control almost anything. I think God continually reveals more about Himself (through His creation) to help us keep our "great" advances in proper perspective. Although I do not believe there are other life forms in our universe, I do believe God is currently working on other creation projects. Our God is a creative God and I believe He always has and always will be creating things. I don’t believe, however, that they are part of our realm or dimension. It is quite possible that God is currently working on dozens of other creation projects in other realms. Obviously, we have no idea how many other realms or dimensions God has created. We shouldn’t be surprised that an Almighty God (a being who has no beginning nor end) would be restricted by our simple four dimensions (height, width, depth, and time). The Bible briefly mentions some of these other realms. For example, we know Heaven and Hell are not part of our realm because they won’t be destroyed when our universe is destroyed. Heaven and Hell are eternal in nature, whereas our universe is in a continual state of deterioration. When you buy a new car it doesn’t take too many years for entropy (2nd Law of Thermodynamics) to turn it into rust. Even if God doesn’t destroy our universe in a couple thousand years, it would eventually come to an end on its own. Our universe is like a big clock that has been wound up; it will eventually unwind itself. Angels and demons are creatures of multiple realms. Not only can these beings operate fully in our realm, they can also operate invisibly behind the scenes. Our laws of physics do not bind them and they can traverse back and forth between our realm and Heaven. Our souls are another example of multiple realms. Although our current bodies are made of flesh and blood ("carbon-based life forms") our true identity is spiritual in nature. When our body dies, our soul will leave its earthly vessel and continue living. Our souls are not made up of the materials from this dimension. That is why a person’s body could be completely vaporized by a nuclear bomb and his soul will depart totally unscathed. Am I convinced that we are alone in this universe? No, of course not. I may be completely wrong in my speculations on this subject. It wouldn’t bother me, however, if I am wrong about this. It wouldn’t shake my faith or theology if we do find life out there. As I mentioned before, these are my opinions, not Biblical dogma. As I contemplate the immense size of our universe, I usually do not wonder about extraterrestrial life. Rather, I spend my time pondering the age-old question of why would such an awesome God care so much for mortal man? Why would God Almighty seek our friendship? The only stars we see at night are the ones in our own galaxy (Milky Way). The stars in the other galaxies are too far away to be seen from our planet. I would like to point out that there are three nearby galaxies that can be seen with our naked (unaided) eye. They are the Large Magellanic Cloud, Small Magellanic Cloud, and Andromeda. The only reason we can see them is because they are over 100 billion times brighter than an individual star. One of these galaxies (Andromeda) is over a trillion times brighter than a star. Yet, because these galaxies are so far away, they only appear as faint stars. Although evolutionists believe the universe has been in existence for about 15 billion years, most Christians do not. Many Christian scholars have estimated that the universe has been in existence for only about 6,000 years. If you believe in a literal seven-day creation (which I do) you then believe the universe was created around the same time Adam was created. Look at the chapter 7-Day Creation: Literal or Figurative? for more information on this subject. Using the genealogical records provided in the Old Testament, many scholars say Adam was created about 6,000 years ago (4,000 BC). There are, however, some disagreements on a couple of the genealogical dates. An example of a book providing a detailed timeline from Adam to Jesus is The Wall Chart of World History (Publisher: Barnes and Noble). Although the universe has the potential of existing for several dozen billion years, God will cut its life short. God has a special plan for mankind and the Bible says that when He is finished, He will destroy the universe (Revelation 21:1). The Bible provides a description of several events that will take place in the "End Times." First, the Christians will be taken out of the world ("Rapture"). Second, seven years of trouble ("Tribulation") will immediately follow the Rapture. Third, after the Tribulation there will be a period lasting a thousand years where Christ will rule directly here on Earth ("Millennium"). At the end of the Millennium, there will be a "short season" when Satan will have one final reign. At the end of these events, the universe will be destroyed. Once the Rapture takes place, the countdown clock is set in motion. After the clock has been started, there will only be 1007 years (plus a "short season") left for the universe. The question, of course, is when will the Rapture take place? No one knows when Jesus will come as a "thief in the night" and rapture His church (1 Th. 5:2), but it could happen at any time.